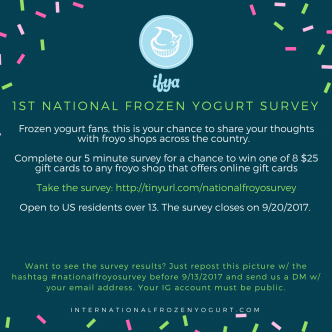 LOS ANGELES - Aug. 23, 2017 - PRLog -- The International Frozen Yogurt Association (IFYA) is conducting the first National Frozen Yogurt Survey. The goal is to better understand the US frozen yogurt market. There will be two versions of the survey, one for frozen yogurt consumers and another for frozen yogurt shop operators. The consumer survey launches today and is open until September 20, 2017. It includes questions about loyalty, current consumption, future consumption and frozen yogurt attitudes and preferences. The survey is open to anyone over 13 who lives in the US. Survey participants will be entered into a drawing to win one of eight $25 froyo shop gift cards. * Winners can select a gift card from any froyo shop that sells online gift cards. Frozen yogurt shop operators (and others who are interested in the survey results) who share the survey invitation will receive the results of the consumer survey. Operators simply need to share IFYA's pinned Facebook post (https://www.facebook.com/froyoassociation/), survey Tweet (@froyogirl) or Instagram survey post (@intlfroyoassn) by September 13, 2017. The frozen yogurt shop operator survey will launch in September. Anyone who completes the operator survey can sign up to receive the results of that survey. The operator survey will include questions about operations, main challenges, supplier satisfaction and more. Furthermore, suppliers and others will also be given the opportunity to share the operator survey. As with the consumer survey, those who share the operator survey will have access to the results. Survey partners who offer to sponsor a prize for the operator survey will have access to both sets of results. IFYA members will have access to a limited set of the results of the consumer and shop operator surveys at a later date. IFYA advisory board members and IFYA experts will have access to the full set of results. Additionally, non-members will be able to purchase the survey results in the future. "We created the National Frozen Yogurt Survey to help our members and shop operators by providing them rich data that has never been available before. This the first time a comprehensive survey of frozen yogurt consumers and shop operators has been conducted. We hope that this will become an annual survey," said Susan Linton, President of the International Frozen Yogurt Association.